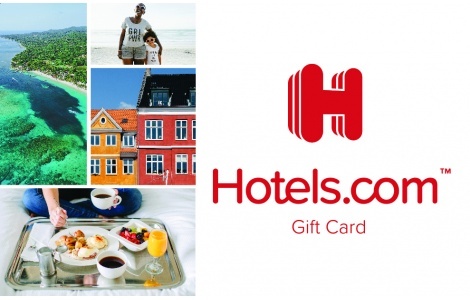 The Hotels.com Gift Card is the largest and most flexible hotel gift card, redeemable towards bookings at hundreds of thousands of places to stay in 200 countries and territories worldwide ranging from international chains and all-inclusive resorts to local favorites and bed & breakfasts. Redeemable at www.hotels.com/gc. National Gift Card is the perfect place to order your Hotels.com gift cards in bulk. Gift cards are our specialty, and we are always willing to help you set up your gift card solutions program today. If you would like more information about Hotels.com’s bulk, direct-to-recipient, or individual gift card fulfillment for your gift card program, please check out our contact page or call us at 888-472-8747. Usable up to balance only for new hotel bookings at www.hotels.com/gc. Only one gift card can be redeemed per online booking, but multiple gift cards may be combined into one gift card by visiting the balance transfer tab found at www.hotels.com/gcbalance. Not redeemable at hotel locations or if you choose the Pay at Hotel option online. Not redeemable toward existing bookings. Not redeemable for cash unless required by law. Not reloadable. Safeguard the card. Not replaced if lost or stolen. CARDCO CXXXIX, Inc. is the card issuer and sole obligor to card owner. CARDCO may delegate its issuer obligations to an assignee, without recourse. If delegated, the assignee, and not CARDCO, will be sole obligor to card owner. Card is distributed by Hotels.com. However, Hotels.com is not an obligor to card owner. Purchase, use or acceptance of card constitutes acceptance of these terms. For balance inquires visit www.hotels.com/gcbalance or call US Toll Free 1-888-999-4468.